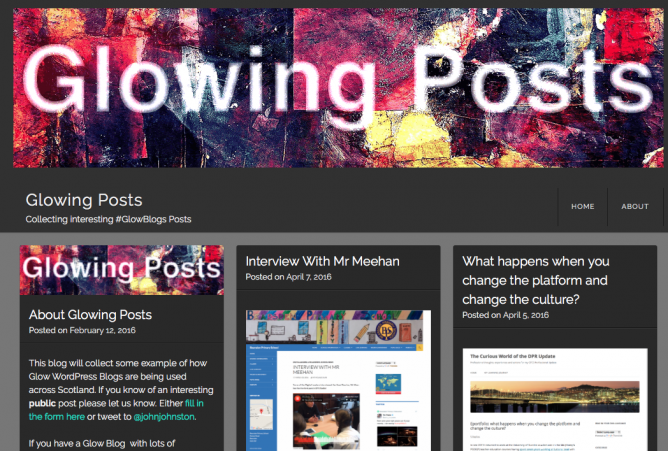 I’ve started a new blog Glowing Posts | Collecting interesting #GlowBlogs Posts. The title says it all. The purpose of this new blog is to collect some examples of interesting ways that Glow Blogs are being used. I’ve found some good ones already. The idea is to highlight posts rather than whole blogs. If you know of any you can let me know via a form on the site, twitter or any other way you can thing of. Are Glow Blogs a form of CampusPress? Here in Victoria, Australia the state government pays for edublogs. It is so underutilized and I feel that people aren’t always aware what they have. No, but same idea, Glow Blogs are our own WordPress Multisite setup (or 33 multisite one for each Local Authority). Got around 160,000 blogs created, most not public, lots are pupil portfolios. Interwsting. Being your own setup, is it just WordPress.org or does it have similar restrictions as Edublogs. P.s. Love the idea of a curated blog to celebrate glowing examples. It is WordPress.org with our own setup, users authenticate through Glow (shibboleth), all Scots pupils and teachers have accounts. As with any multisite there are limitations. Limited choice of themes, plugins ect.